Binary Options Scams – The real deal? Binary Options are rather young and started to become popular in 2012. A lot happened since then and pretty much everything that happened was bad. The reason? It’s not about trading but about “making money”. Binary options would be a nice product for novice traders. Imagine everything is so simple. You just click up or down. You take a look at the chart and decide what is likely to happen. Then you get a fixed payout or your bet is lost. Simple as that. But just offering this trading product was not enough. People started to make a real business out of it. So instead of telling them “hey, look at that how easy it is to trade and how exciting it can be!” they said “hey, look at my quick-millionaire super hyper money strategy that will make you at least $5,000/month on autopilot!”. And guess what was more exciting? Yes, people are that naïve. They are looking for answers to their problems and when someone comes and looks like a solution they are hooked. And then they start crying “hey, I paid $100 for this ebook and it did not work!” or “hey, I’m trading with this strategy for two weeks now and lost $1000 so far!”. So what happens is that people start to say bad things about binary options and this industry in general. They make it as simple as possible for them. Instead of asking if they have been too naïve they pass the buck to the industry. And in this case nobody wins. This doesn’t mean that it’s the trader’s fault. It is only partly. Whose fault it is are the 1023475 schemes that only exist to exploit the weakness of people and make money with them. Nothing else. ForexScams was focused on CFD trading from the beginning. Binary Options was not really a topic when we started. But now it is. What we are going to do is expand our website and give people a chance to report Binary Options Scams as well. We will update this eBook accordingly and send you the latest versions. Please also check ForexScams.org for scam updates on Binary Options. As previously said, it is sometimes difficult to perceive the difference between a Forex scam and a fraud, brokers being quite clever about the boundaries of terms. Both scams and frauds encompass charging the client’s account for different commissions. Therefore, be sure that the spread will be the only broker’s fee. Many market maker charge incredibly overpriced swap (rollover) fees, and the nastiest ones will charge “Automatic Sweep fees” (transferring your profit into the currency of your country). This is absolutely forbidden and you should tell your broker you’re aware of this practice. Another scam consists in selling software or “trading robots” supposed to guide you and/or make profit for you when you are away or sleeping. There’s no robot in this world that can react according to breaking news (such as ECB announcement or HSBC report). Robots are expensive and won’t help you much. Another scam that may concern big investors comes in the way of “managed accounts”. If the broker says the capital will be managed by a professional in exchange of a commission, this might be “Ponzi” schemes. The most famous example is the French man Bernard Madoff who tricked a dozen of high line investors into investing money for his fictitious company. By proposing high leverage, both Market Makers and no dealing Desk brokers encourage traders to place very large positions. This increases the transaction as well as the risk of loss if the market doesn’t move where it is supposed to move. While professional currency traders such as banks, financial institutions, Pension Funds and other hedge funds tend to use no more than 15:1 leverage, retail clients may be offered leverage between 10:1 and 500:1. Many brokers offer bonuses but in order to take advantage from them you must trade and get three times the bonus “value”. This is another technique to trick you into overtrading and increase your chances to lose money. In other words, you’ll never see your bonus! Some brokers may tell you that scalping is forbidden! So however amazing it may sound, this is the case of ETX Capital (London), which changed its regulations after a phone call with me last week! The reason is simple: a market maker may not have the time to find counterparty in case of fast profit and should pay you right away from its own capital. ETX Capital considers that scalping is an operation than doesn’t exceed 2 minutes. Therefore, better ask your broker if scalping is allowed. On the internet, there are many advertisements promising fast and significant gains by trading the foreign exchange market. These ads’ main targets are beginners, because seasoned traders know that profits do not come in a snap. One tip: if the offer sounds too good to be true, flee! The trick of the Forex coach is widespread among corrupt brokers. The principle is simple: a salesperson calls you and literally sells his/her coaching services. He or she shares with you his/her insider tips, techniques, qualities in terms of trading, performances, etc. and trick you into joining the “winners team”. You are invited to open a trading account with the broker and enjoy free services. Obviously, once the account is funded, the story is not at all the same. Unregulated brokers often practice this type of scam. Generally, these dealers are counterparties and trade against their own customers. This means that when they win, their traders lose money. If you set out to win too, so the broker will change the trading conditions to his advantage. Some broker will even update their regulations. With the amount of existing scams on the Forex market, new companies have emerged. This is your company offering to help you recover the swindled funds. It is important not to trust these structures that take huge commissions if funds are retrieved. It is better to discuss your problem with the AMF, a reliable and dedicated authority for the traders protection. As you can see, there’s no quick and easy method. Making money on the Forex market is about learning (2 years minimum), and there’s no need of robots or magical signals. Learn the craft and money will come! Traders who got scammed by Market Makers may think that No Dealing Desk (NDD) brokers may be a better or smarter choice. We are going to see that this may not be the case every time, although these brokers offer more attractive options. Indeed, NDD brokers confront the traders with the real interbank market, which can turn out sometimes to be a losing game for domestic traders are most of the time undercapitalized compared to banks’ huge capital. In theory, the most undercapitalized party has more chance to go bankrupt thank the other. Let’s take FxPro broker. First of all, FxPro charges 10 percent of each deposit you make. After a phone conversation with them, they were unable to justify such a practice. The main argument of the No Dealing Desk broker is about very low spreads. Some of them display ultra-competitive spreads and they hype themselves up on the web. However, like a market maker, a No Dealing Desk offers “floating spread”, means that the wonderful 0,6-Pip spread you have heard about when registering may turn into a 1,6-Pip spread when you trade! If you decide to work with a NDD, get sure to deal for “fixed spreads”. So far, the FOREX trading in Israel was not subject to any regulations. In European countries, this over-the-counter activity requires a strict and quality regulation. This lack of regulation in some Middle-East countries has allowed unscrupulous companies to encourage the Israeli public investors to inject capital in the FOREX market without any protection or guarantee. This scam has spread all over the world and too many people still get trapped in this bad business. Authorities set out to design a legal framework in 2004 by appointing a special committee. In 2010, a law was voted, establishing the principle of regulation and authorization mechanism was to be specified by the regulator (Israeli Securities Authority). The regulation, which is still being discussed in the Israeli Parliament before the finance committee, should be adopted this year 2016. The stated objective of this regulation is the protection of investors. Operators will thus have to comply with a number of good practices. Among them, in addition to the financial security and management requirements, we can mention a limitation of the use of leverage, coherent marketing and advertising with the strict interdiction to offer bonuses to entice the customer to register, or an enhanced disclosure requirement. Most of Israeli scammers have their main office in Cyprus. They do so because in this area, the Market Authorities have no power and cannot intervene. In order to avoid any further problem, don’t choose a broker located in Cyprus, this is a red flag. •	Are there withdrawal fees? •	Is there any limit to withdrawals? •	Are there other fees or commissions than your spread? •	Should I deposit at least 1000 USD? If the broker answers “yes” to every question quoted just above, he’s certainly a scammer. – www.finanzasforex.com / Evolution Market Group Inc.
A Forex scam uses a trading scheme in order to trick individual traders into believing they can be easily profitable on the foreign exchange markets whereas the only purpose of the scammer is to steal their capital. These scams actually come in a wide range so it is sometimes difficult to make the difference between a scam and a “fraud”. Most of the time, online brokers will protect themselves from being accused of fraud and will resort to “legal” tactics to deceive their clients. In this eBook, we will focus on few strategies used by Market Makers. These brokers claim no other transaction cost than their “spread”, namely the difference between the “bid” and “ask” prices. You have to keep in mind that the Forex market is a sub zero sum game (or “over-the-counter” market), which means that any profit made by a trader represents a loss for another one. But in the end, both pay the broker. Simply put, it means that Market Makers earn money upon their clients’ losses but must pay the winner, and therefore you find yourself in a conflict of interest every time you initiate a trade (the market maker is counterparty every time). Brokers will display their most competitive spreads but will often forget to tell you if these are “floating spreads” or “fixed spread”. A broker such as ETX Capital (London) offers a 0,7-Pip spread for the EURUSD, but this spread can reach 1,8 at certain times of the day. Increasing the spread allows the broker to cash in more, but this can also be a technique to prevent underfunded traders from entering the market when brokers don’t want to pay their clients. This is a current practice of XTB (Paris) to raise major currency pairs spreads during 1 or 2 hours when market opens on Sundays (from 11.00pm to 2am). Spread on GBPUSD, for instance, can be as high as 14 Pips! This broker also changes the USDCAD spread every evening from 11.00pm to 1.00am (Paris time), and even if you have entered the market before this time, your trade will be charged the difference and you will see your account go down even if price doesn’t move! Solution: to avoid this problem, get the “Fx Hot Times” exe. 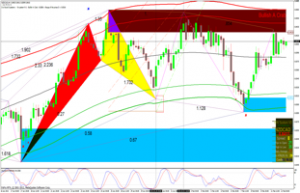 indicator for MT4 platforms. This indicator will show you, for each currency pair, the high price volatility during which spreads are tighter. Avoid trading at a low-volatility time. Remember that traders can find it very tough to prove that market manipulation has occurred because there is no centralized market in this business, but interconnected marketplaces controlled by market makers. Sometimes called “Rollover”, a Swap is the commission charged by a broker when your trade runs over midnight. Many market makers tend to overcharge their Swap that can reach 2 or 3 USD for one Standard contract. Solution: if you don’t want to pay more than the spread, focus on Intraday trading or initiate a trade after midnight. Market Makers will often encourage their customers to trade with high leverage. Never over-leverage your positions, for this increases the likelihood of a margin call and a quick loss, which will close your position(s) immediately. Brokers will automatically close your position if you reach a 70-percent loss of your capital, arguing this is their role to protect you. Don’t believe a word of it; what they only want is to soak you for all you have worth! 1) Use efficient, visual indicators such as Harmonic Patterns, Center of Gravity (CG), Triangular Moving Averages (TMA) and Supply/Demand areas (SupDem), and Stochastics to see when to close or open a position. These indicators will help you visualize your transaction. 2) Use a very strict Money Management and adapt the lots to trade according to your capital. In general, don’t risk more than 5 percent of your capital. You can find programs on the web that will calculate for you the amount you should trade according to your available capital. Stick to this.